Whether you want to admit it or not, if you participate in firearms related activities recreationally there’s a chance that you will encounter a Gun Shot Wound (GSW) type incident, and if you’re a law enforcement officer, there’s an even greater chance that you’ll have the need to provide aid to yourself or a bystander on or off the job. There’s also a chance that by carrying a firearm or other lethal tool that you may be wounded, or need to provide aid to a loved one, or encounter an innocent bystander that is injured. That’s where having a med kit and the training to use it comes in. The Low-Vis Inside the Waistband (IWB) Med Kit is aÂ low profile design that lends itself well to use in virtually any and all formats. From being worn on body inside the waistband to being worn off body attached to car seat head rest, this kit is extremely versatile. There’s also a piece of rubberized Velcro that wraps around the ends of the zippers of the kit so if worn IWB, it can be ripped upwards to release the earth magnets and it can be ready to use. Internally there are various pockets and elastic bands to hold any form of medical equipment small enough to fit in the kit. On the front of the kit there is an elasticized mesh pocket backed on soft-sided Velcro so as to be able to attach unit patches or your blood type. The flexibility of this kit is one of its best features. It can be used in a variety of settings ranging from jobs in a low-visibility profile to the everyday person on the go. Compared to traditional medical kits that for example utilize Velcro or clips as attachment points, the earth magnets on this IWB kit mean its ready to be deployed whenever you are. It has strong retention, but not so much that you wonâ€™t be able to get it out when you need. With a simple, direct and intentional tug the magnets will separate thereby allowing the user to get to their desired medical items. 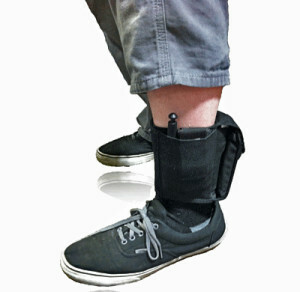 The No-Vis Ankle Medical Kit (NVAMK) is veryÂ minimalist and is by far the most low profile product I’ve worn. Even though the user is able to set up and use whatever medical products they want in any of the various pockets, Rogue Gunfighter (RG) recommends situating the main fold-open pockets to sit on the back of your calf. The reason for this is that this is for the most part the widest part of your leg and most pants sit the â€œbaggiestâ€ in this specific area. 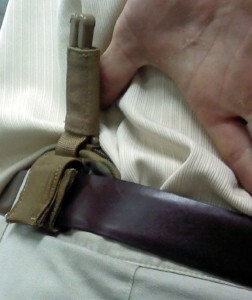 With that being said, when the user puts the NVAMK on, the Velcro opening should sit directly in front of the shinbone. This setup this allows the NVAMK to have a zero visibility signature. When used in conjunction with RGâ€™s LVR or MOAB plate carrier that has a soft-sided Velcro admin panel on the chest, the user can deploy the NVAMK on the move and realistically attach the medical kit to the admin panel and provide self-aid even if one of their arms is disabled. Also if you are in a situation where you need to provide medical aid on the move, this would be another great reason to utilize attaching the NAVMK to yourself if wearing one of these plate carriers. One thing to note is that when wearing low-cut sneakers this kit may be a tad uncomfortable, as it will slide down and rest on the bend of your ankle. However, if you go with midto high top boots this kit will rest perfectly on the top of the footwear. I have personally worn this kit daily – it adds little to no bulk, is extremely comfortable and breathes as if youâ€™re not even wearing it. At the end of the day, whether youâ€™re a law-abiding citizen, military member or part of law enforcement, a med kit and the ability to use it should be part of your daily wear. Not knowing how to perform immediate medical aid for yourself or others is obviously a bad choice, but knowing how to and not having the necessary gear on you is potentially worse. This is more than just being able to purchase products that you can carry throughout your day-to-day life, itâ€™s also about being able to recognize what you may lack in training. 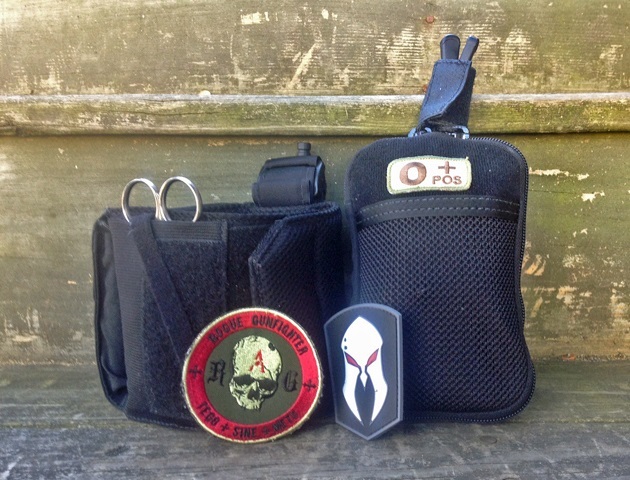 If you have the training, then Rogue Gunfighterâ€™s IWB Med Kit and No-Vis Ankle Medical Kit should be added to your inventory of medical gear. Instead of hoping that the worst never happens, you can be aware that itâ€™s possible, and you can be ready for it to occur. I’m not sure why they have 2 different versions? Makes you wonder if they’ve decided you should bleed out if you’re not LE or EMS; or just to jack up the price. If I remember correctly, the LE/MIL version has a metal strip embedded in it so it can be easily found in an x-ray. The non-LE/MIL version does not have the the metal strip. Add a bit of tinfoil? Why would this make it “restricted”? Boggles my mind why anyone who carries or uses firearms would not carry a blowout kit much less a first aid kit. I’ve always considered it and obligation, a duty. I see this on practically all of the vendors who sell both. *I was incorrect on my LE vs MIL verbiage in my original comment. Pardon the mistake. However, on the Rogue Gunfighter website, I don’t see the restriction notice. Thanks for the insight. Now I fully understand why the foil is included. I carry a D.A.R.K. MILspec pocket kit almost always. i get nervous when i don’t have it now. now im very tempted to get the RG kit, thatway i can have a static kit in my BHUT/bag/locker and one always on me. love RG’s gear.